Do you ever wonder where the money comes from to administer funds for the purpose of grants and low-interest loans to Lutheran congregations in North Carolina; grants and scholarships for education of pastors and for other religious educational and charitable purposes? It comes from organizations like ours. Each year the Home Mission Foundation administers low interest loans to establish new mission congregations and also help expand and strengthen established congregations. Grants and scholarships are given to seminarians preparing for the ministry and for the continuing education of pastors. So how do we get the funds we use? It comes through the financial support of people like you. A tax deductible donation can be made online by clicking on the “Planned Giving” tab. You may choose to contribute through estate planning and reflecting your wishes through your will. One such donor was Ms. Sarah Roof, a lifelong member of Daniels Lutheran Church in Lincolnton, NC. Miss Sarah was a lady who was very interested in Home and Foreign Missions. Upon her death, her estate established the “Roof Mission Endowment Fund” which was to be administered through Daniels Lutheran Church. Her instructions were to divide the proceeds from the endowment with half going to Foreign Missions and half to Home Missions. 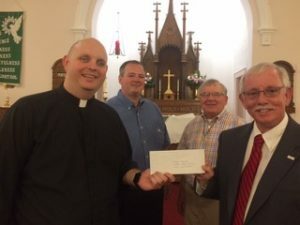 Therefore, in July 2017, a gift of $10,000 was given to the North Carolina Lutheran Men in Mission Loan and Gift Fund and the Home Mission Foundation. Miss Sara was very active in the life and ministries of Daniels for over 90 years. She supported charitable causes within the community and church. Her legacy will live on through her generous gift. Mrs. Mary Lou Seagle Cline, a lifelong member of Daniels Lutheran Church, Lincolnton NC, was a very humble Christian lady who attended and supported her church faithfully for 90 plus years. In June, 2014 her estate gave a significant gift of $83,000 to the Home Mission Foundation. She was very generous to other religious and community organizations such as Daniels Lutheran Church, Christian Ministry of Lincoln County, Habitat for Humanity, Hospice, United Way, etc. Click this link to view a special message about Mrs. Cline. With your support the Home Mission Foundation can further its efforts to advance the Kingdom of God in North Carolina. Thank you in advance. We appreciate your support.